——Ootori Ouka stood in the wasteland. A single woman lied down on the dry and cracked earth not even a single plant grew on. Ouka aimed the gun at the woman and exhaled roughly. "Haa... haa... with this... my revenge is finally over...!" The woman lying on the ground was Ouka's hateful enemy. She took away Ouka's control over her body, and had her kill her own parents and even her beloved little sister. Ouka entered the Antimagic Academy, has become an inquisitor, rose up to the rank of an inquisitor, and after several years she finally found her enemy. Many years have passed since that tragedy. She dedicated all of her adolescence to Inquisition, made no friends nor a lover and ignoring her surroundings she lived all alone. It could be said that Ouka didn't live a human life. There was nothing she found fun. She pulled the bolt and inserted a bullet into the chamber. "I'll apologize to my family once I'm in the afterlife...!" It was finally the time for Ouka to be rewarded. Once she pulls the trigger, she will definitely feel better. Her lips twisted into a smile trembled as she put a finger on the trigger. "Once I kill you I'll finally be——............ah......!" Ouka's lips stiffened and she stopped speaking mid-sentence. The words in the back of her throat wouldn't come out. She furrowed her eyebrows, puzzled. I'll be done with my revenge... and what then? The gaze fixed on the woman had moved to the handgun's muzzle. The woman's face ahead of the muzzle had grown hazy. ...what happens to me once I kill this woman? Ouka noticed that with her family killed, once she completes her revenge she will have nothing left. While Ouka searched her memories of the past, the woman ahead of the muzzle's point laughed. ——Kill me. I killed your family. You'll feel better once you kill me. She spoke the words as if to hurry Ouka up. But even despite the mockery, Ouka's finger didn't move. If I kill this woman here and now, I'll have... nothing left. Revenge was my only goal in life, I'll have nothing left once it's done. Looking confounded, Ouka looked around seeking help. There, was nothing but a wasteland. The other side of the horizon was blurred with heat haze, as if reflecting her own life waiting ahead. There was no one. There was nothing. She couldn't see anything hinting her how should she live from now on. ——Now, take your revenge. You've lived for this moment, haven't you? The woman spread her arms and waited for Ouka's judgment. But Ouka's will had faltered. Is it really correct to take my revenge like this? Would killing a woman who desires death fulfill her revenge? Ouka had a feeling that she knew the emptiness of revenge. Although she shouldn't have fulfilled it, she seemed to already know the uncontrollable emptiness that comes afterwards. A few drops fell on the dry earth. When she touched her cheeks, she realized they were her tears. Ouka realized why was she crying. The apologetic feelings towards her family for not squeezing the trigger in front of their killer, and the loneliness of being alone have brought Ouka to tears. Living only for revenge was unforgivable. Once her revenge is over, she needs someone to be by her side. Ouka felt like she was told so by someone. She was unable to recall the face of the person in question and shed tears from sadness from forgetting the memory of the person she should have been together with. It was something very precious to her. Although it might have been just her delusion, she should have held it preciously. Ouka looked up to the sky, squinted, and wiped her tears. Bearing her anger, Ouka put away the gun in the holster and took out handcuffs from her backpack. While the woman continued to request that Ouka kills her as she was being handcuffed, Ouka just glared at her. "This is my revenge against you... live, and continue regretting your sins..."
She replied to the woman. ——Are you going to live all alone while bearing your half-hearted decision? You'll feel better once you kill me, you know? "I don't mind. This must be my punishment for devoting everything I had to revenge." Let's live. Let's continue to live while carrying this half-hearted emotion. Even if it's hard, painful, lonely, I'll continue to bear it and live on. When Ouka closed her eyes the surroundings were wrapped in darkness. The woman who should have been in front of Ouka has disappeared, although she should have been standing in the wasteland, now she was in the middle of empty darkness. Her memory returned immediately. She realized that herself standing in the wasteland was a fabrication, and recalled her feelings for her irreplaceable comrades. Ouka wiped off the tears with her hand. And gently squeezed her fingers wet with ears into a fist. "...I'm not glad that was just a dream. Emptiness still remains inside me despite that." She muttered as she felt a gaze from behind her back. "But if I didn't meet my comrades, I would have to continue living burdened with "loneliness"." Ouka turned around and looked at the master of this dream, who stood behind her. Seeing Kiseki face downwards without budging even an inch, Ouka smiled. "You have my thanks. For reminding me of my own foolishness... and not killing me, letting me live." She walked up to Kiseki and stood in front of her. "I won't say I understand how you feel. But I can understand a little of your feelings for Kusanagi. I too... am a woman." Ouka paused there and put her hand on her chest. Kiseki didn't say anything in response, but Ouka continued. "But the world doesn't consist of just Kusanagi. There's plenty of people in it and plenty of ways to live. You probably don't know that." "Back when I was only interested in revenge, I knew nothing just like you. The ones who taught me everything were Kusanagi, and my comrades from the 35th platoon." "Please... don't give up on this world. It isn't too late for you to learn about it together with Kusanagi. I too, want to know more about y——"
While Ouka attempted at persuasion, Kiseki unexpectedly took a step forward. Kiseki raised her head and moved her face closer to Ouka, as if to press against her chin. "Then tell me... tell me what should I do..."
Her face hidden behind her bangs wasn't visible. "Don't give up on the world? That's not it. It wasn't Kiseki who gave up on the world, it's the world that gave up on Kiseki." "You have it nice, Ouka-san. You can walk by Onii-chan's side. Mari-san, Usagi-san, Ikaruga-san too are allowed to be by his side. But do you think the world will forgive Kiseki for being by Onii-chan's side? When Kiseki has this body?" "...We will make it so that you can be by his side, surely. We'll make your body the same as other humans..."
"You say I can become the same? How many people do you think Kiseki has killed? Even if she does as Onii-chan wants, Kiseki will be caged anyway. Nothing will change from now." "That won't happen...! It's your body that's at fault, your heart is that of a human——"
"——So you know nothing! Kiseki wanted all of this!" Ouka leaned backwards a little and looked towards furious Kiseki. Reddened eyes peeked out from behind her bangs. Kiseki stretched her thin arms and grasped Ouka's neck, then strangled with abandon. At the same time Ouka became unable to breathe and Kiseki's fingers bit into her throat, the world around them changed again. A different scenery——it was not. She returned back to the real world. When Ouka opened her eyes, she was wrapped around by red meat. In front, there was Kiseki's main body strangling her. This isn't a dream——it's reality. Buried inside Hyakki Yakou, Ouka couldn't move. She tried to release herself from Kiseki grip by using her barely-moving right hand, but Kiseki was overwhelmingly stronger. "Kiseki told everyone right at the start, but no one understood. Kiseki's body grants Kiseki's wishes... this is no lie, both Onii-chan and Ouka-san are both so dumb. Everything would have settled nicely if you just killed Kiseki before this happened." There was no light in Kiseki's eyes. It seemed like she gave up on everything, there was only frustration remaining in her. "It's too late now... Kiseki is no longer satisfied with just being killed. I can't bear the fact that once I die, Onii-chan will be happy together with Ouka-san. That's why I tried to destroy the world so that Onii-chan dies with me..."
"But Onii-chan is stubborn, so that didn't work too. I really hate Onii-chan, actually. "Takeru-kun" also hates me now and I killed lots and lots of people so there's no going back. It's over for Kiseki doing her best as well." Hands bit into Ouka's neck even more strongly. "You are the only one Kiseki will kill... you, the one who stole Onii-chan from Kiseki, will not become part of Kiseki... you will die by those hands." "Otherwise, Kiseki won't be able to stand it...!!" There is no other way, Kiseki added as her mouth distorted and she put more force into her hands. But as a proof of the fact she wasn't sure of her choice, a string of tears flowed from her eyes. Ouka struggled to free herself from Kiseki's hands, but she was unable to do anything with just her own flesh and blood. With her consciousness fading, she watched Kiseki. Kiseki's dripping tears seemed like they were the despair overflowing from inside her. No one knew just how much tears had she shed so far. Just how much pain was she living in. She continued to live while retaining her sanity until the moment she had broke out of the deepest prison to meet her brother. But Kiseki who was in front of Ouka, looked like a normal girl. A weak girl with delicate heart you could find anywhere. A foolish little child who had her heart broken by the overly brutal situation she was in. ...I...can understand how she feels. Ouka couldn't help but to look back at her own life. When her family was killed she didn't know how to live. She took the path that might have been wrong... found a way of living called revenge, and nourished herself with it. Just like current Kiseki, there was no other way for her to be saved. Right now, she's very similar to how I was when I completed my revenge. Ouka thought. The fact one of us achieved their goal and the other didn't makes no difference. The despair from having nothing left once everything's over is the same, she thought. What differed between them, was whether they had someone by their side. Right now in front of Ouka, there was herself who didn't have comrades. Her own father and mother who gave their life to protect her. Her own hand stained with her little sister's blood. The memories of her frozen heart being gradually warmed up by her comrades. Revenge against her family's killer, Laugh Maker. And finally, Takeru's warmth wrapping around her emptiness. Ouka stopped resisting and put her hands on top of Kiseki's hands strangling her. "You'll kill me...is that enough...? Will you be satisfied with that?" "Then...would you...forgive everyone with my death...?" Seeing tears trickle down from Ouka's eyes, Kiseki weakened the grasp on her neck by just a little bit. "I understand that won't be enough for you...but please, Kiseki...I don't want..."
"I don't want...to lose anything else that's important to me...ghh, not ever again...I want to feel that way..."
Ouka discarded them all and cried. She cried as if to plead Kiseki to spare her life. Surely, she must have looked pathetic to Kiseki. Her appearance was really pathetic. But Ouka could no longer bear the emotions. She knew well how weak her heart was. For a long time now she knew that among the platoon members, she had the weakest heart. There was no mistake that other members of the platoon were different from her. They would face Kiseki with anger, try to persuade her, or oppose her. But Ouka could only face Kiseki like this. She could only bet her life and plead for her life. "Please... don't kill anyone else...!" She begged single-mindedly. As to reach Kiseki with her own feelings, the feelings she tasted so far which made her heart nearly break, she begged her. Kiseki stared in shock at sobbing Ouka's face. But before long, tears started to spill from Kiseki's eyes as well. As if responding to those tears, Hyakki Yakou wrapping around Ouka also shed tears. Ouka's feelings were pouring inside Kiseki. It was because Hyakki Yakou was connected to Ouka in order to show her dreams. Kiseki said in panic as she strangled Ouka. Her despair after losing her family, her feelings for her comrades and the emptiness from when she accomplished her revenge. Gratitude for Takeru and the warmth have all flowed inside Kiseki. Kiseki was unable to stop her tears from flowing as she strangled crying Ouka. Inside the dream, Saionji Usagi said this. You can't understand humans with just their memories. Ouka's feelings were truly a proof of that. One was unable to understand people just by looking into their memories. It was understanding the feelings of the person holding the memories that allowed someone to "understand" that person. The sorrow rushing into Kiseki and her falling tears spoke of the understanding she held for Ouka. She was able to understand how Ouka feels. Ironically, the first human Kiseki was able to understand wasn't her brother or "Takeru-kun". ——It was Ootori Ouka, the person she hated the most. "I don't want to understand you...stop it...!" Although Kiseki's own experience was far more ghastly, she was unable to deny Ouka's feelings. It was because she felt sympathetic to Ouka that she was unable to constrain her tears. Kiseki yelled with sorrow and frustration. Being strangled even more strongly, Ouka finally resolved herself to die. "Good grief, thee keepeth getting into trouble aren't thee, Master. " That's when a voice resounded in Ouka's ears. Momentarily, an electric current rushed through Kiseki's hands strangling Ouka and they let go of her. When a very slight distance opened between them, a man appeared separating the two. The man dressed in something that seemed like a red cloak had Ouka drop to her knees and on her back, then expanded a barrier. Kiseki waved her arm and used Hyakki Yakou to crush Ouka. The surging meat smashed onto the barrier causing sparks to scatter intensely. Ouka had never seen the man before. She was unable to see inside his hood, but there was no one among her acquaintances with such a big back. But she immediately understood who was he. "You idiot. I recall not taking fool as a master of mine, one who would throweth that her life away f'r her comrades sake. Knoweth thy shame. " This preaching hoarse voice was without doubt that of Vlad's. It was completely different when she heard it with her ears rather than just having it sound in her head. But despite the arrogant and horrible attitude, it was a low and gentle voice. "Howev'r... 'tis very much like thee. Thy heart is as vulnerable as ev'r. Weak. So weak yond it made me feeleth like I wast bringing up an infant." "That man... Kazuma also didst the same thing to protect thee. Thou resemble him to a most wondrous extent. " She was unable to see Kiseki's appearance inside the wall of meat, but Hyakki Yakou tried to swallow Vlad and Ouka in the meantime. The place they were in now was deep under the ground, most likely above and below them was filled with Hyakki Yakou. Surely, Hyakki Yakou that had a tremendous volume had converged all at once towards Ouka and Vlad. Vlad was a Magical Heritage. When he used magic alone his magic power consumption was very inefficient, so his magic power would run out before long. Ouka's sanity returned and she stretched her hand to Vlad, but was unable to reach him as her body was still bound. "Do not haste. Listen to me f'r a moment." "But at this rate...! Use my blood!" "There is no needeth. T's not enough to reacheth surface. Thou wishest to help thy comrades, am I right?" Vlad stopped smiling and quietly exhaled. "Do not worry. There is a way." His reliable back slowly rose up. And Vlad stretched out his arms. "——I shalt changeth mine own soul into magic power. There is no other way." "Don't screw around...! There's no way you can do t——"
"I can. A Magical Heritage's soul is something born from magic power. And of course, reversing the process is possible. It definitely isn't an irreversible process." "You can't! I won't allow it! I am your master! Listen to what I say——"
The strong declaration interrupted Ouka. Vlad lowered his arms and looked up as if looking at the sky. "This is fate. He hath lost his life and the next contract'r yond appeareth... wast his daughter." "Vlad... stop this...! We'll somehow manage if you use my blood! You won't know unless we try, right?!" "What of thy comrades if thou die? What about that brat. About that foolish demon girl. Thou wanteth to save, right? Everything that is." Ouka's eyes were full of tears as she outstretched her hand. You can't do that, Ouka struggled. "With this, I shall dispel mine regrets." Vlad said with a sigh. Heavily, very heavily he grit his teeth and spoke, as if spitting out his words. "This is mine... atonement f'r not saving Kazuma. 'T was mine mission to stay by his side. Thy fate to seek revenge also traces its roots back to mine weakness..."
Ouka opened her eyes wide hearing Vlad's words. He kept regretting the fact that he dissolved his contract with Kazuma. He felt regret that he let Kazuma leave Inquisition alone when Kazuma chose his family. If he was able to protect Kazuma, Ouka wouldn't have become a vengeful demon. "...You're wrong... that's wrong, Vlad...!" Ouka finally understood what was Vlad burdened with. Her stretched-out hand grasped nothing. "Don't go... who will scold me if you aren't there... who will keep spitting curses in my ears..."
She clenched her teeth and still continued to stretch her hand to him. 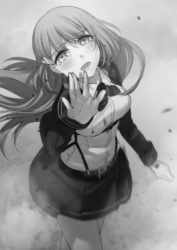 "Please... don't leave me alone...!!" Vlad turned around and strongly embraced Ouka. "Thou art not alone. Believe in thyself, believe in thy comrades. Be noble. That will be thy weapon strongest of them all." "Even after becoming an empty husk, I will surely respond to thy nobility." After he spoke his words, cracks appeared in the barrier. It probably wouldn't hold more than a few seconds. There was only a little more time left for them. Ouka's eyes were full of tears. What do I say. There's surely something I want to tell him. Gratitude for countless times he helped her in the past, apology for hurting him so many times, and her happiness for how he accepted her despite the fact she wasn't honest... also other than that there were many other things she wanted to say. It were the last moments she could remain with her partner. But no words had come out. Her emotions welled up, but no words came out. Ouka slowly raised her face crumpled with tears and looked up at Vlad's face. At his not visible face, hidden inside the shadow. "Don't, go...don't... leave me...stay by my... I don't want to..."
What came out of Ouka's mouth was only a wish carried by emotions. Hearing those words, Vlad took off the hood hiding his head. "Ouka, thy blood——was more delicious than anything else in this world." ——Smiling gently Vlad said his final farewell to Ouka. Ouka's field of vision was filled with tremendous power and light. She wailed inside of that light. In her hands she held Vlad's husks. In order not to forget him, in order not to let go ever again, she held them strongly in her hands. She would not forget Vlad's face. Surely, she would never forget that enveloping smile, resembling that of her father's. Ouka opened her tear-filled eyes in the middle of the light. Bearing the sorrow and nobility inside her chest she crossed the both guns in front of herself. Wishing that they reach her partner, she unleashed them. After returning to the surface, Kiseki screamed unable to withstand the unbearable emotions. She thought that compared to what she had experienced, the sorrow, anger and pain Ouka had experienced were nothing. But the feelings that flowed from Ouka had squeezed Kiseki's heart powerfully. At the same time, they made Kiseki feel incredibly envious. Despite experiencing that much despair, the one who extended a helping hand to her when she fought all alone was Takeru. And not just Takeru. There also were other comrades who supported Ouka. Ouka's feelings for people precious to her have pierced through Kiseki's heart more than anything. Because it reminded her of her loneliness to a painful extent. Ouka who didn't hold any emotions prompting her to destroy everything was dazzling, beautiful, and made Kiseki envious of her. "Why... that person is the same as Kiseki, but why only Kiseki is..."
When she spoke out her frustration, Kiseki realized that wasn't the case. Wrong. Kiseki was the same as Ouka. It wasn't like she had nothing. Takeru continued to stretch his helping hand to Kiseki. Even if his feelings weren't the same as her wishes, she had Takeru by her side. It was selfish and self-righteous, but Takeru's feelings for her were honest. ——I will definitely make you happy. He came to meet her and said the same thing over and over again. She had someone who would walk by her side, just like Ouka had. It was only now that she learned how happy that could make someone. She learned that through Ouka's feelings. "Kiseki destroyed it herself...? She was the same as that person, but shook away Takeru-kun's hand...?" She had broken all of it with her own hands. She made a mistake in the Alchemist's First Research Center, when she reunited with Takeru. If she took Takeru's hand, she wouldn't have become like this. She would have become the same as Ouka. Back then the one who was wrong wasn't Takeru, but Kiseki. Allowing her desire to monopolize stand in front, it was Kiseki who gave up on everything. If she took Takeru's hand, the despair Kiseki thought waited ahead, wouldn't have come true. She understood that well now, that she had received Ouka's feelings. Even if she received a human's body and was confined in a painful, dark prison, surely she would hold the same feelings as Ouka. The world was cruel and might have not forgiven Kiseki, but Takeru would. Takeru alone would have stayed by her side. Even if he had comrades, even if he had Ouka, Takeru would never abandon her. Because surely, everything precious to him was equal. Kiseki understood that well with Ouka's feelings. Kiseki struck the world into chaos, took away countless lives and was rejected by her brother. If that was just it, she would somehow manage. But because of Ouka, regret was planted into her. It was the first time in her life that she felt regret. She had never before regretted making the wrong choice in the past. Embracing herself Kiseki looked around her. There was nothing. She was all alone. All there was around her was red meat... she herself. The emptiness she felt was dreadful. At this rate the entire world would become her, and she will be all alone in the entire world. Kiseki raised her voice, trembling. It was too late. All too late. No one would forgive her any more. "Takeru-kun" won't forgive her either. There was nothing but regret after what she had done. She would live forever, embracing regret over what she has done. That was something she wouldn't be able to bear. "——It's not too late yet. People can redo things time after time again. Just like I have." A voice sounded from below. Kiseki raised her tear-stained face. When she did, she saw a red flash break through Hyakki Yakou-filled surface and fly high into the sky. Slowly, she had emerged from inside the flash. Spreading large wings, looking like the devil——Ouka once again appeared in front of Kiseki. Around her, there were Mari, Usagi and Ikaruga all wrapped in a red spherical barrier. Ouka not only escaped from that hell of Hyakki Yakou, but also found her comrades and brought them back to the surface. She looked down at Kiseki, just a little angry. "You have to choose, Kiseki. If you wish for destruction, I will reject you." "But if you wish to accept Kusanagi's help..."
Ouka closed her eyes and retracted her anger. Said this, and stretched out her hand to Kiseki. N-no shame for crying for the loss of a great man, right? Yeah, w-why must we cry!? She returned back to real world. She returned back to the real world. The fact she hadn't gone mad is enough to describe how strong was heart heart. The fact she hadn't gone mad is enough to describe how strong her heart was. She knew well of how weak her heart was. The surging meat smashed onto the barrier causing sparks scatter intensely. I recall not taking a fool who is't would throweth that her life away f'r her comrades sake, a master of mine. I recall not taking a fool [in] who is't would throweth that her life away f'r her comrades sake, a master of mine. "Why... that person is same as Kiseki, but why only Kiseki is..."
"Why... that person is the same as Kiseki, but why is only Kiseki is..."